Apple is poised to introduce new emoji with iOS 13, and we're getting a preview of the new characters today, four months in advance of Apple's WWDC 2019 keynote. There's a voluminous 230 new emoji coming with the OS update. This breaks down to 59 distinctly new emoji, 75 gender variations taken into account, and a full 230 when you consider new skin tones, according to Emojipedia. Apple is said to have specifically proposed emoji designs for disabilities from the Unicode Consortium, so that's a big part of what's coming to iOS 13. That means sprites for manual and motorized wheelchairs, people with canes, hearing aids, deaf people, and mechanical arms and legs. Service dogs and guide dog emojis are also a part of the next update. Move over pancakes, because there’s finally a waffle emoji, ideal for annotating your battered breakfast or creatively describing someone who waffles on issues. Believe it or not, you couldn’t properly emote yawning in texts before, but that’s destined for iOS 13, as are simple icons for person standing and person kneeling. 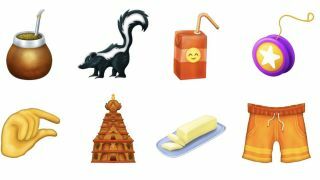 We’re also finally getting food characters for onions, garlic, falafels, oysters and butter, all of which emoji you thought existed before today, but didn’t. Juice boxes, ice cubes, kites, yo-yos, parachutes, and diving masks will get their due in iOS 13, and new animal emoji join the pack with orangutans, sloths, flamingos, otters and skunks. New clothes and accessories include an orange safety vest, sari, one-piece swimsuit, briefs, shorts and ballot slippers. Music icons finally get their banjo solo, the only new instrument we see. Hurt? There’s emojis coming to give you other options beyond the bandaged face. You’ll now have access to drop of blood, adhesive bandage, and stethoscope to describe your pain, in case you fall over a wooden chair (a new emoji) or fall victim to an axe (also a new one). There are a lot of new useful emoji due to come to iOS 13. Aren’t excited? The final one we’ll mention is the yawn emoji – that’s for you.